Two of my favorite fixes! We hauled up my great-grandfather's dining table and sideboard this weekend. My aunt had it sprayed with auto-body paint several years ago. In addition to dated colors, the finish itself had chipped and cracked. The price was right (free!) for a classic shape. I decided not to paint it with by hand; it's going to rain, and I didn't feel like sanding brushstrokes. Spray painting a flat surface has its downsides, though. It's hard to avoid those characteristic streaks and gritty feel. We gave the table four light coats and moved it indoors. Now I'm applying my best secret, BriWax . A local shop has the most gleaming furniture around, and they recommended it to us years ago. BriWax is an all-natural product that combines beeswax with carnuba. It cleans, stains, and polishes to a lovely shine. Though it can strip some painted finishes, I've found that several coats fill in rough spots, making a soft, touchable surface with a subtle glow. BriWax isn't cheap ($13 at Amazon, or $16 locally), but one can lasts a long time. Forget about dusting with Pledge or refinishing furniture with polyurethane. Briwax enhances the existing patina with a fraction of the effort. Bri-Wax? Thank you for that. I am going to see if I can find an online vendor. We have a nice coffee table that our dog lightly scratched while she was a pup. This may be just what that table needs. I only have one piece of heirloom furniture, an Amish hutch built by an Amish relative, it is light oak and old. Would this stuff work for it, or is it mainly for dark finishes? If it is a deep gouge, you may need to use a bit of stain (Minwax Stain Pens are great) before waxing. Briwax comes in a variety of tints, but the coloration may not be saturated enough to fill it in completely. Briwax tints are more for overall evening of color or light surface scratching. I am absolutely amazed at your creativity and frugalness in your home - thank you for sharing! It gives me more reason to be more creative to use what we have wisely! So, do you keep a stock of different colors of Briwax? I'm thinking of beginning with 'clear,' although most of our furniture is oak. That would be nice, but I can't really afford more than one can of it! 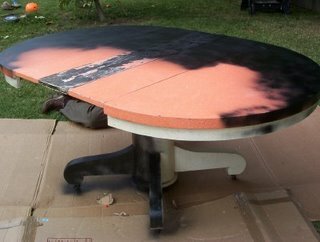 Last time I had dark brown, which I used on the trestle table project and then on the rest of my wooden furniture of all different shades. It didn't seem to make much difference. This time I bought light brown, originally to do some small tables. I figure I can use it on anything; at its most it will add an aged look to a piece of painted furniture. Furniture of more color, like cherry, might benefit most from having an actual match. Meredith, thanks for your reply; I'm about to order 1 can. Probably clear. fyi -- I have found an ebay seller who charges $12.50 for the Briwax and $3.50 shipping for your whole order. So, you could order one can and pay $16, 2 cans and pay $28.50 -- for an indiv price of $14.25. Three cans would be ... hmmm ... $41, or $13.67 apiece. I don't like to drive, so having things delivered to my door is a big plus. I bit the bullet and ordered 2 cans -- 1 of Clear and 1 of Golden Oak. It's $28.50, shipped to my door. Now I hope it arrives when DH is at work; I'd like to surprise him with some nice looking kitchen cabinets. For just coating and buffing, I figure I can do the kitchen in an afternoon. Or am I too optimistic? BTW, the ebay seller was named 'pawts'. Meredith - I am really interested in this too. I'm glad to know they have clear. I refinished our dining room table and six chairs with stain and then a polyurethane and now I need to keep up on the poly top-coat. Would this work instead of that? I was also inspired by a previous comment to do my kitchen cabinets! What would you suggest for the table? It is maple and then just stained and sealed. It would be perfect for a dining room tabletop. I like to apply it using 0000 steel wool. (It sounds like it would scratch everything up, but it gets the wax worked down into the grain). About kitchen cabinets--it will be a LOT of work to buff so many doors. I'm almost afraid that the grease and oils generated by cooking may meld with the wax or something weird like that. That's one place you might prefer something more scrubbable like polyurethane? I would try it on a piece of furniture first and see how you like it before ordering or applying enough for cabinetry. 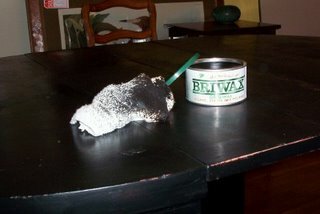 How I use Briwax: I apply the first thin coat with 0000 steel wool. Let it dry to a dull finish. You must let it dry or it will remain smudgy. Then buff with a soft cloth. Buff, buff, and buff some more. I always say a handheld orbital buffer would be handy here, but never get one! Then you can apply another thin coat and repeat. The more thin coats, the harder and shinier the finish will be. The Briwax that I ordered on the 16th -- at 5 p.m, Maine time -- arrived in the Southwest on the 19th, around 2 p.m. Blazing fast. I'm impressed. With all my commitments, it arrived too late to do anything to surprise DH,-- and he was off work today. Hopefully I'll sneak some time to polish the dining room table on Monday. I ordered some clear Briwax before Christmas and just got it done on my buffet a week or so ago - it turned out GREAT! I was impressed with how easy it was to apply and how beautiful the results were. Thanks for the tip!